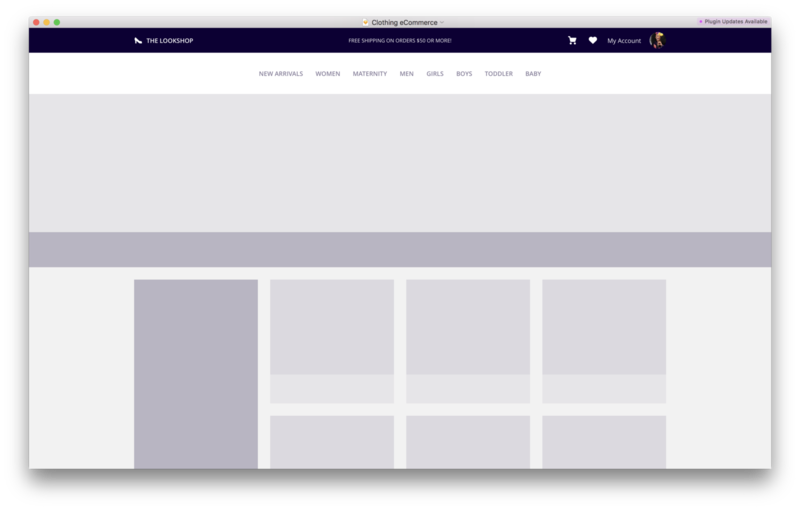 I pull back the curtain to show you exactly how I design screens — translating requirements into designs, hinting at future feature functionality, and revealing Sketch best practices. Every edition will have a freebie so you can see exactly what my file looks like. Monkey see…monkey do! 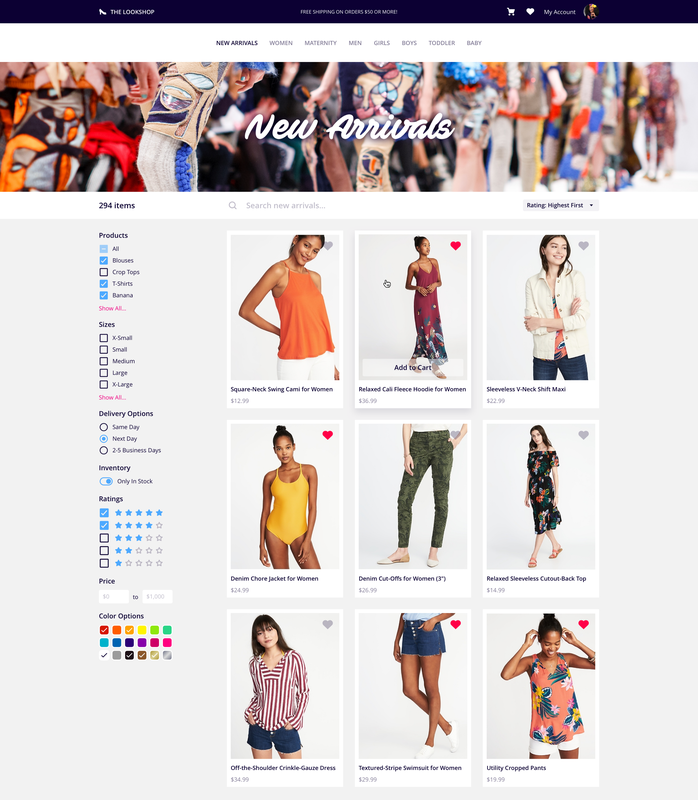 An eCommerce collection page. It’s simple, but there’s lots going on here, and lots to talk about! Thanks for the dummy content, Old Navy! This [fake] screen is being used in a pitch deck to raise funding. I pretty much always start at the top and work my way down. In 90% of UI designs, that means starting with the navigation. In this case, I knew I needed: shop branding, a shopping cart, a user profile, and site navigation. I had to decide whether or not I wanted to squeeze everything into one horizontal bar, or split it in two. A single nav bar saves about 80–100px of vertical screen real estate, but things would be getting pretty tight. 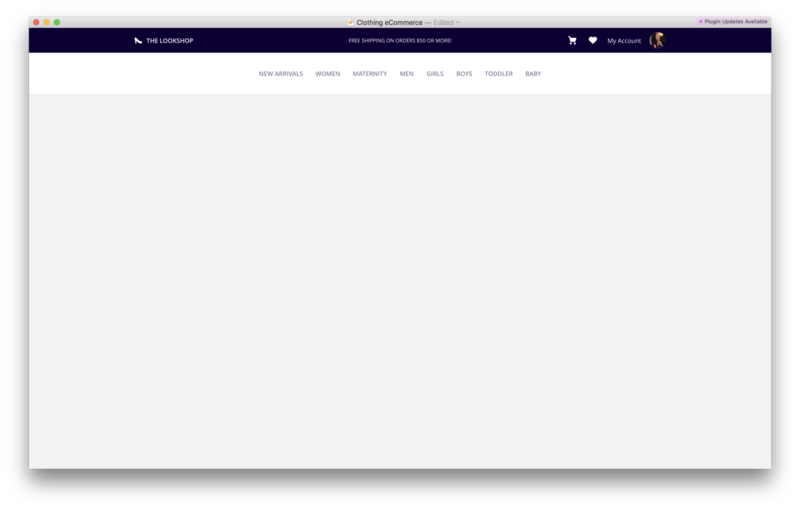 To future-proof the site navigation against new product categories (which would grow wider and wider), I opted to split the nav in two: a kicker nav and the product nav. The kicker nav is where site branding and user account information lives. 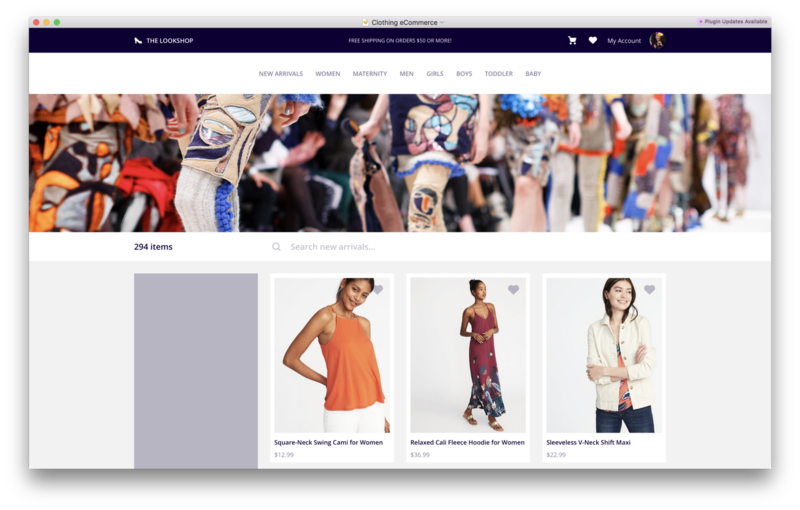 It’s simple and compact because it’s going to be on every page of this eCommerce site. The kicker background is dark for the same reason…it’s there, but you might not notice it unless you’re looking for it. 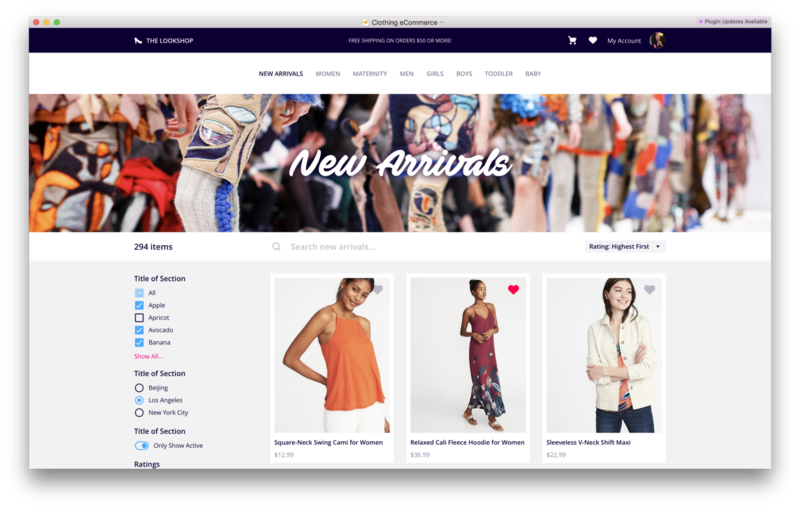 Contrasting the kicker nav, the product nav is taller and brighter — users will be flying around this site searching for the perfect summer dress, and we don’t want to get in the way of that with a teeny-tiny, not-so-clickable-or-obvious product nav. Quick tips for designing faster and more effectively. Symbolize the Nav: You’re going to be using it on tons of pages, and you’re not gonna want to update each one individually. Use Text Symbols: Text symbols will allow you to visually denote the active page by overriding the nested text symbol. Ways that you can present this feature to various stakeholders. Kicker Banner: When I present this to someone in the executive suite, I’m going to mention the kicker banner as an opportunity to drive sales through sales periods and discount codes. Favorites: When I present this to product marketing, I’ll talk about how users can favorite items without having an account to drive them toward the signup form. Continuing down the page, I decided that I wanted to support product marketing by introducing a page banner that would be custom to each product category or collection. This section wasn’t explicitly in the requirements, but since the purpose of this screen is for pitch, I tend to always push about 10–15% beyond the base essentials to help strengthen the story. I knew that this section would end up being highly visual and eye-catching, so I knew it would be a welcome addition. I don’t have any philosophical reason why I tend to flesh out the nav in full fidelity. I just do. For the rest of the page, I’ll spend about 10 minutes blockframing a bunch of potential layouts before settling on the final one. Page Guides: For the love of God, please use them. Don’t wait until later. Blockframing: I don’t even like to use color when I blockframe a page. It wastes time, and I end up getting caught up in hex codes. Also, be lazy and very general. The dark box on the left will eventually be a column of filters. I know that. I’m not going to waste my time blockframing them. A simple rectangle is more than enough. Collaboration: Believe it or not, this is the best time to get feedback. While it may not look far enough along, this is when stakeholders give the most useful feedback around layout and feature functionality. If you wait until later, you run the risk of the client getting caught up in colors and fonts, and they’ll most likely give you pretty poor guidance. After browsing around on Unsplash for a couple minutes, I found an image I was happy with to give the design some character. Candidly, most UI is pretty boring. It really only has one job, and that’s to help the user accomplish a task. The content of an interface is what gives it life. Maps, photos, illustrations, products…if anything else on the screen is overly flashy, it’ll probably end up competing with the content. You don’t want that, particularly if you’re trying to sell something. The beauty of a page like this is that there really aren’t too many unique sections that you have to design. Your job is really all about layout and UX, because we’re letting the content shine, remember? On pages with lots of repeated content, I find it advantageous to design a single item and duplicate it, effectively “completing” a large chunk of the UI in one fell swoop. If you have the patience for it, I’d also recommend filling your repeated items with unique content so you can see get a feel of how the design will appear and perform out in the wild. The sooner you identify a line-wrapping or readability issue, the sooner you can correct the design to accommodate it. Symbolize Early, and Often: You should know by now that you ought to be using them, but this tip is all about using them from the very beginning. Don’t wait until the page is fully designed to go back and build proper symbols. You won’t. Photography: Since the design of the product cards isn’t all that special, I’d probably focus on the style of photography, and how it works well with the grey background the page. The design is really starting to come together now, and the last big piece that needs some TLC is the page filters. I tried to think of every possible filter control I could think of and just have them ready and waiting for whenever I would need them. The screen above, and many more, are included in UX Power Tools. 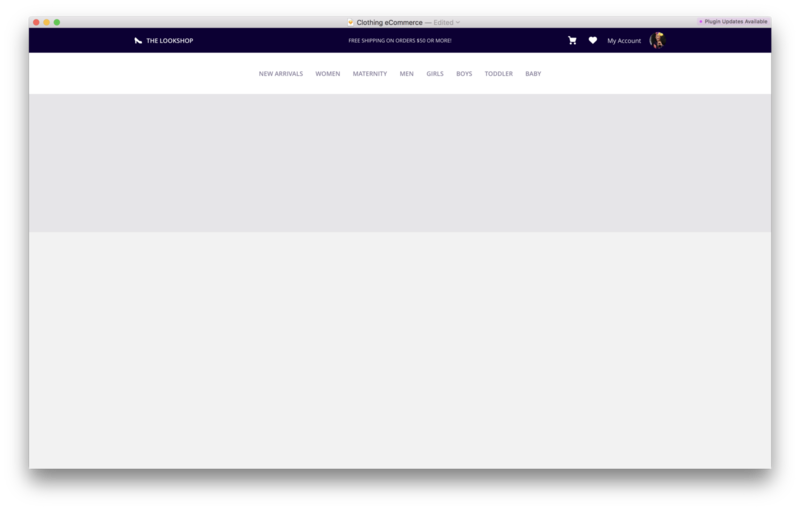 Now obviously it’s not going to be perfect as-is, but I’d much rather spend 20 minutes customizing it to fit the mockup instead of 2-hours battling with checkboxes and star ratings. It’s a really subtle addition, but it satisfies the requirement for adding items to a shopping cart, and will give developers a better idea of your UX vision. Save Common Components: If you’ve designed the same thing more than three times, it’s probably time to start building a set of common components and design patterns you can pull from. It’ll save you more time than you can imagine Time is money! Cursors: This is a dumb one, but create a bunch of cursor symbols to use in your mockups. Please don’t use overly cartoony Mickey Mouse hands. Realistic Dummy Data: I didn’t really have to spend time making the filters on this page realistic, but I can guarantee with almost 100% certainty that the client would have pointed it out and gotten distracted otherwise. Believe me, for your own sanity, it’s worth your time. Not too terrible! Product pages like this are fairly rudimentary, and there is so much more that I can do with it (ad banners, product details, hover states, search workflow), but you can see how each section can be constructed and presented thoughtfully so as to maximize effort and minimize push-back. 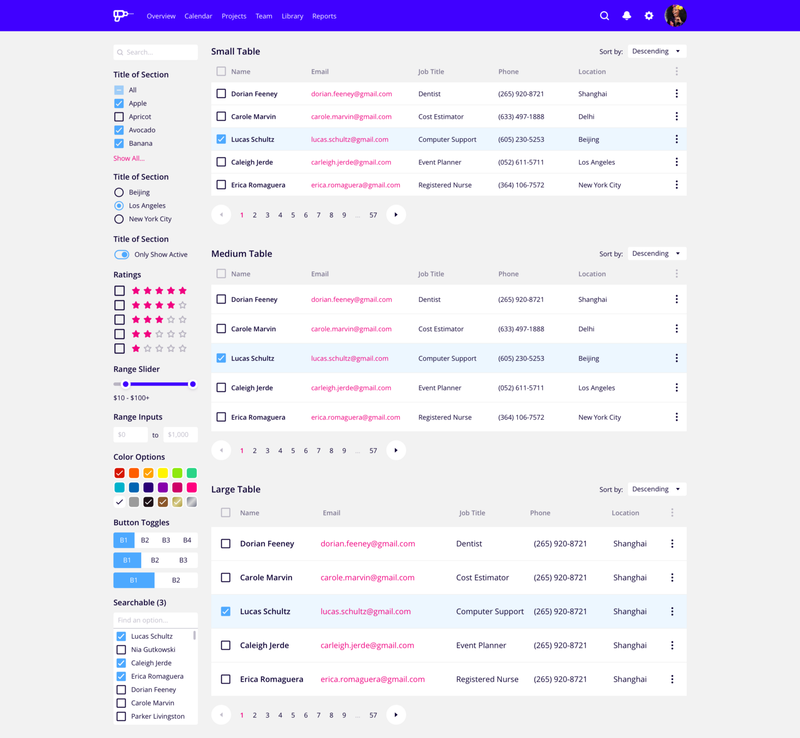 When I’m not spending my paycheck on clothing, I’m working on Sketch design tools at UX Power Tools to make you a better, more efficient designer.